15.1 Who are the Mozilla Camp contact persons in Barcelona? 15.2 And in case of an emergency? 15.3 What if I want to come early or stay late? 15.4 What weather should I expect? Mozilla Europe is organizing a large two-day Mozilla conference in Barcelona, Catalonia (Spain), Oct 25-26, 2008. The conference, officially called "Mozilla Camp Europe 2008", aims to bring together Mozillians (staff and community members) from 3 main areas - DEV, l10n and QA - with a special focus on Europe. The DEV tracks will encompass lots of different sub-areas (eg. Firefox, Thunderbird, Fennec; Add-ons, Labs etc..). To define the DEV tracks topics and their format, "track leaders" have been identified and have been asked to brainstorm with their teams and active members of the Mozilla community on topics they would like to tackle and the participants they would like to invite. Since the conference is, logistically speaking, just around the corner, it is important that all track leaders get back to Mozilla Europe by August 25th with their session suggestions and a list of up to 15 people they think Mozilla Europe should invite and suggested topics for your tracks. The team at Mozilla Europe have come up with a suggested list of focus areas and sessions for the DEV tracks. Feedback, suggestions or comments are more than welcome. 5) How to deploy TB (Fx) in the enterprise? 11) How to create an extension? John Lilly - CEO, Mozilla Corp.
Aza Raskin - Labs, Mozilla Corp.
A maximum of 200 participants can be invited to the conference sessions/workshops. The morning keynotes on Saturday and Sunday will be open to the public, to a maximum of 300 people. The 2 day conference will be held at CitiLab just outside Barcelona (see map). You can go on a very cool virtual tour of the venue here. All invited participants will be staying in one of the 2 hotels Mozilla has secured for the event. An email containing detailed information on their hotel has been sent to each participant. Both hotels are very near the conference venue and from metro/train/bus stops. For a Google Map view, http://tinyurl.com/5tyt2b. The Novotel Cornella is a 30 min walk from CitiLab. A special shuttle service will pick up participants staying at the Novotel on Saturday and Sunday morning/afternoon and drive them to/from the CitiLab. The NH Hotel Cornella is a 5 min walk from CitiLab. All participants who are their room with another participant will stay in this hotel. Check out the Mozilla Camp Europe Map to have a good idea of where you'll be staying and the different places participants will be going to. Mozilla staff members and volunteers will be present at Barcelona airport's main meeting point in Terminal B standing in front of the Caballo de Botero (you can't miss it!) on Friday 24 October from 11:00 to 20:00 every 30 min. You will recognize Mozilla staff by their Mozilla Camp Europe tshirts (and gleaming smile!). If you come by the meeting point, you will be given a free travel pass your conference badge and instructions on how to get to your hotel. If you arrive outside those hours, don't worry, you'll receive your weekend travel pass and conference badge at your hotel. In the airport, follow the train signs that will lead you to the train station. You'll need to use your T10 ticket (or buy one if you arrived too early or too late to get one at the Mozilla Airport meeting point). Take the right exit Av. de Girona (see picture), walk out of the station, and continue straight on Avinguda Salvador Dali then turn right on Avinguda Pablo Picasso and continue on until you reach the round about. The Novotel Cornella will be on your LEFT. By taxi, it's a 15 min ride and it will cost you between 15-20 EUR so make sure to carpool if you can ! By public transport, there is a bus and train option but your best bet is to go by bus. The R10 train leaves every 30 min for downtown Barcelona. Once you're on the train, get off after three stops at Sants Estació. Then, you can either take the R1 train (Direction : Molins de Rei) and get off at Cornellá or you can take the L5 metro line (Direction : Cornellà Centre) and get off at Cornellà Centre. It's a 5 min walk to the NH Cornella from Cornellà Centre. When you arrive at your hotel, you should proceed to the check-in desk where you'll be given keys to your room. Use Friday as a day to relax and get used to your surroundings, as we start first thing Saturday morning! you will be asked for a credit card as a deposit against damage and room charges; attendees are responsible for all room charges such as WiFi, room service, pay per view content, minibar charges and any damage. Both the Novotel Cornella and the NH Cornella are 5 minutes walk from shopping centers and food courts where you can get a bite to eat or have drinks on Friday evening and/or Sunday evening. (see map) A buffet breakfast will be served on Saturday, Sunday and Monday morning for participants staying at these respective hotels. A buffet lunch will be served on Saturday and Sunday at the CitiLab. A buffet dinner will be served at the Sal Café for invited participants. The Novotel Cornella is a 5 minutes walk from Almeda train station. Trains from Almeda to downtown Barcelona leave every 5 minutes. A special shuttle service will pick up participants staying at the Novotel on Saturday and Sunday morning/afternoon at 9am and drive them to/from the CitiLab. If you're staying at the NOVOTEL Cornella you can take any of the following trains (L8, S4, S8, S33, R5 or R6) from Espanya station and all stop at Almeda station. If you're staying at the NH Cornella, take the L5 metro line and get off at the last stop Cornella Centre. The quickest but most expensive way to get to the airport is by taxi. It should not take you more than 20 min and it will cost you between 15-25 EUR. The cheapest option, especially if you're leaving on Sunday, is to take the bus from the CitiLab. Simply take bus L77 right in front of Citilab which goes to the airport. You can use your T10 ticket on this bus. Buses leave every 30 minutes and the journey to the airport lasts approximately 30 minutes. By AEROBUS, the journey will take you 30 min. It will cost you 4,05 EUR (you cannot use your T10 ticket). The bus runs between Plaça de Catalunya and Barcelona International Airport. The conference hotels are a 10 minute cab ride or a 30 min train/metro ride from the airport. An email will be sent to ALL participants 2 weeks before the conference with detailed instructions on how to get from the Airport to their hotel. Each journey allows you to take as many different public transports (metro, tram, bus and train) within a zone for 75 minutes. However, you need to get your ticket thru the machine every time you change transport network (ie. train, bus or metro). For taxis, there is a minimum charge of 3,50€ or so plus distance. From Barcelona center to the Citilab it might cost you some 15-20€. Taxis are more expensive during night time. A buffet breakfast will be served for participants staying at the Novotel Cornella and the NH Hotel Cornella on the mornings of Saturday 25th and Sunday 26th of October. Coffee, snacks and lunch will be served at the CitiLab. Any other food or drink expenses (including room service and in-room minibar charges) are at the expense of the attendee. Mozilla will host a private dinner/fiesta on Saturday 25th at 21:00 open only to participants with a Mozilla Camp Europe conference badge. IMPORTANT : YOU WILL BE ASKED TO SHOW YOUR BADGE AT THE ENTRANCE. When you get off the Metro take the exit “Sortida Port Olímpic – Platges”. Then, turn on your right and walk down the R. Trias Fargas towards the ocean, until you reach Passeig Marítim de la Barceloneta. Then turn right and keep walking along Passeig Marítim de la Barceloneta. After approximately 5 minutes you will find Hospital del Mar on your right. Pass the Hospital cross the road and walk approximately 50 metres. You will see a staircase further down on your left. Go down the stairs and you will find Sal Café. Free wifi is available throughout the CitiLab. The network is called "mozillacamp"
Our friends at Mozilla Hispano just set up the Mozilla Camp's official mashup page, where you'll be able to get LIVE photo feeds and twitts of the 2 day conference. 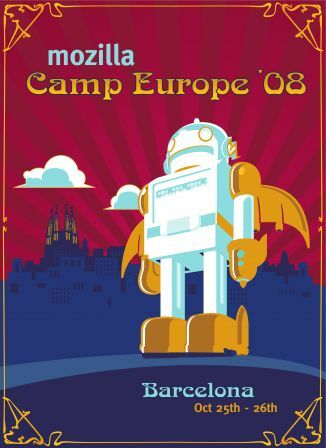 Who are the Mozilla Camp contact persons in Barcelona? There are plenty of hotels in Barcelona. If you do decide to stay on a couple days more, we recommend you find a nice hotel in the city centre and not stay in Cornella, as it is a bit outside of town. Center d’Informació Turisme de Barcelona Plaça de Catalunya 17-S Tel: (807) 117 222 (within Spain) or (93) 285 38344 (international). Fax: (93) 285 3831. E-mail: teltur@barcelonaturisme.com Website: www.barcelonaturisme.com Opening hours: Daily 0900-2100. This page was last modified on 30 September 2014, at 11:52.